Marine wildlife experts extract a breath sample from J50, or Scarlet, an ailing orca. A similar device was used to administer a dart containing antibiotics. 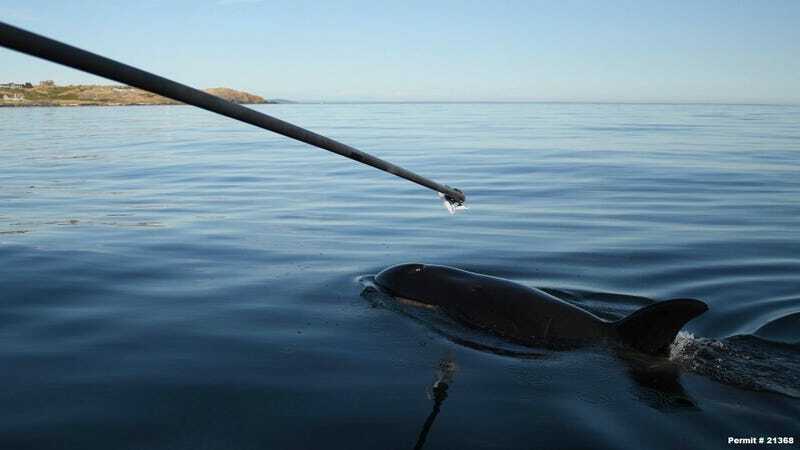 A team of experts injected an ailing orca calf with a dose of antibiotics, in a medical intervention that’s never been tried before on a wild killer whale. Scarlet swimming near her mom. Her condition is also being closely monitored, as this act of desperation is potentially exhausting. Tahlequah has been carrying the dead calf for 18 straight days, and wildlife experts are reluctant to take it away from her, saying it’s a necessary part of the grieving process, and that removal of the calf could fundamentally disrupt Tahlequah’s normal foraging and eating behaviors.